It’s surprising to me how many conversations take place about how to design a website, drive traffic, and capture leads when the answers already exist. Attracting and converting customers online is far from new, so why are companies still trying to figure things out? I get it, if you don’t know what you don’t know, how can you make the right decisions? This outline is going to provide you with an overview of the process that will help you grow your leads and sales online. The details for each step may vary based on your industry and your company’s positioning, but the building blocks are the same. Use this information to guide your company’s efforts, or have a discussion with your marketing team to make sure your resources are being put to the best use. 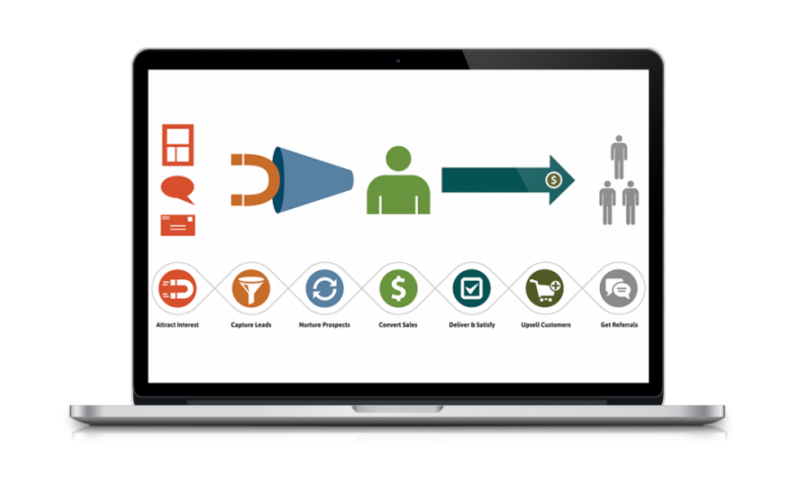 In order to predictably grow your lead generation and sales, you need a system. You don’t need to start this system from scratch, since the system has been built and proven time and time again, even before online marketing came into existence. This system has been helping businesses grow leads and sales for decades. The only difference now is that we have more advanced tools to build and implement this system for your business. A funnel is how a person will go from stranger to contact to customer to referral source to repeat customer. By plotting out this funnel, you will be able to take action on filling your funnel and generating business out of it. Each element along the way plays a role and by measuring and tweaking those elements, you will be able to make your funnel more efficient. This means more customers for you. This is how you will get people to your website. For this conversation, we are talking about cold traffic. People who have not yet visited your website and probably do not know about you yet. Common traffic sources include PPC ads on Google, targeted Facebook ads, banner ads on relevant websites and email newsletters, organic SEO, organic social media promotion, guest blogging, and email. Traffic that we can control (paid traffic, guest blogging, links from our blog posts, social media promotion, email to an existing and relevant list) will be sent to a Landing Page which is dedicated to your campaign with a specific offer that is relevant and timely for your ideal customers. In order for your landing page to be successful in converting a visitor into a contact, there are necessary elements that must be included. 1. Your offer is what people will be filling out the form to receive. The offer is what drives conversions. You can’t just hope that people will remember you down the road. You need to offer something (of value) that your ideal customers will exchange their email address for. This is how you get permission to start marketing to them, and if you’re smart you will use that permission to build equity in your relationship and create a lifelong customer and evangelist for your company. Most people will not buy from you on the first visit. Instead of wasting the effort getting them to your landing page, we want to get their contact information with something that is low-risk, low-commitment from them (exchanging their email address). When driving cold traffic to your website, you are going to want to use a Lead Magnet as your offer before you try to get them to pay you for anything. This will provide value to your audience with little/no time commitment from your end (after it’s created), and can be “paid for” with a low risk cost to them (their email address). 2. Your headline is what speaks to your audience and gets them interested in reading the rest of your page. It also MUST align with the message they read that got them to this page in the first place. If you are running ads, that ad headline must be consistent with your landing page headline. If it is not, then your reader will either think they got duped with a bait and switch or that they ended up in the wrong place. Neither of those are scenarios you want to create. 3. Your copy is what will convince your reader to opt-in to your offer. There are several copywriting strategies that can be used here. Make sure you aren’t just throwing info together or writing from your own perspective (this is for your customers, not for your self-expression). Always remember that clear is better than clever. 4. Images on your landing page should be consistent with what got them there as well. They should also be quickly recognizable and resonate with your target audience. 5. If your landing page doesn’t have a form, then how can it capture leads? Forms are a must-have for your landing pages. A quick tip for your landing page forms: the fewer form fields you use, the more conversions you will get. Stick to what you absolutely need for getting to the next step of the relationship. Usually it can be simply First Name and Email Address. You can get more info from there. Validation traffic is what you’ll use to validate that your offer is worthwhile to your customers and that people will actually be interested in doing business with you. The fastest way to drive traffic for validation is through paid advertising. This can be Google Ads that show up in search results when someone searches Google or social media ads like Facebook where you create a targeted audience demographic that aligns with your offer (do not confuse Facebook Ads with clicking the “Boost Post” button, they are distinctly different things). With a relatively low budget, you can validate your funnel before dedicating more resources building out the back end sequences and offers that ascend your customer relationships and before you start putting more resources into driving traffic. Once you’ve validated your short funnel (an ad, a landing page, and an offer), then you can start building out your follow up sequences, increase your ad budget, and start rolling out other traffic sources like SEO, social media promotion, partnership promotions, etc. After someone fills out a form on your landing page, you will not only need to deliver what they requested but also build your relationship with them and move them through your sales funnel. Make sure your email marketing software provider offers a connection to your website forms and an automated email campaign tool. Most of the email marketing platforms today do this. Now that you have permission, you should be sending a personalized email campaign that is relevant to your offer and will nurture that new contact into a paying customer. This is not something to feel badly about, as long as you believe that you actually add value to your customers. If you believe that you add true value to your customers, then you have an obligation to earn their business. Don’t be lazy and wait for people to come calling, most of them won’t. Once someone has expressed interest in what you have to offer, it’s time to move them up the value ladder. This means giving them more value and you making more money. A fair trade, right? Again, these sequences can and should be automated so they can be delivered at scale without any effort or potential of slipping through the cracks. We all make mistakes, but an automated system can help us reduce those mistakes so that our customers can get more value from us and so that we can make more money in less time and without unnecessarily duplicating efforts. Now that your funnel is ready to scale, it’s time to send more people to your landing page. Assuming that you’ve used a paid channel to drive your validation traffic, now is when you increase your spending. You have a funnel that you will be investing money into, and it will be multiplying that money in customers on the backend. With a profitable funnel in place, you can begin expanding your growth exponentially by building your organic traffic through Search Engine Optimization and social media marketing. Explore each channel. Make sure it is trackable so that you know to keep investing or to move your resources to something more profitable. Once your system is in place and multiplying your investments with customers, start creating more funnels and continue multiplying your customers. Need Help Building Your Growth System? We have spent over a decade developing our proven systems for attracting and converting customers online. If you need help putting your system in place, we offer a free 30 minute phone consultation to talk about your business and your goals.